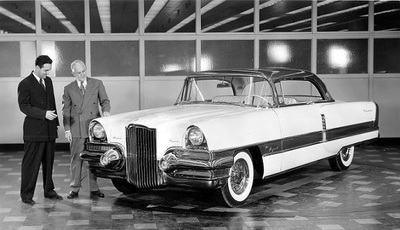 The Packard Request was one of the very last Packard show cars built in 1955 before the factory permanently shut down. It was built for the increasing request by customers to re-establish the long, vertical grill from Packard’s prewar era. The car took a quick tour through the dealership channels and returned to Detroit when Packard dissolved. Prominent Packard collector Ralph Marano found the car derelict in a field with accident damage and subsequently restored it for the 1983 Packard club annual convention in Oakland, CA.